Are you a teacher that doesn’t currently incorporate writing on a regular basis in the classroom? Are you “too busy” to add yet another piece of cross-curricular requirements to your already overflowing plate? Guess what? Bud Hunt (aka @budtheteacher ) is calling you out, and he’s got a posse…in the form of the Common Core Standards. I’ve been giving the Common Core a look through in the past few weeks, and I have to say that I’m really impressed and excited for what they’re bringing to education, at least in terms of cross-curriculum integration, and technology inclusion. Michigan adopted them last year, and while they haven’t been implemented yet, I wanted to be prepared, so I’ve been looking for different examples, experiences, and voices that support what the Common Core is all about. Which leads me to Bud Hunt’s excellent post about students and teachers as writers over at the PLP Network blog. Bud is a huge advocate of the National Writing Project, and in the post he asks a lot of great questions, and makes a lot of great points, starting with “when was the last time you wrote with your students?” I must confess, as a former technology teacher, there were many days when I never wrote with my students depending on the project at hand; we were up to our eyeballs with photo editing, movie making, and globetrotting via Google Earth. But there were just as many days that I spent editing wikis with my students, commenting on blog posts, and writing scripts for podcasts, all great forms of writing that prepare students for the 21st century. Some of Bud’s comments go on to support the funding crisis that the National Writing Project is currently facing, and while I support him (and you should too), that’s a topic for another reflection. RH.11-12.5. Analyze in detail how a complex primary source is structured, including how key sentences, paragraphs, and larger portions of the text contribute to the whole. WHST.11-12.10. Write routinely over extended time frames (time for reflection and revision) and shorter time frames (a single sitting or a day or two) for a range of discipline-specific tasks, purposes, and audiences. There are many more standards focused on writing for the specific content areas, but I threw in the last three just in case you missed “analyze”, “cite”, and “evaluate” in the first three standards; three exercises that more often than not usually require a person to write! Now you may be saying that your standards or district specific curriculum already embed these types of standards in all content areas. Whether your district does or not, I’m willing to bet that the actual process of writing, what that last standard was talking about, is more often than not overlooked in content area courses. Why spend time writing, reflecting, revisioning, and focusing on your audience in a World History or Honors Biology class? Because HOW you write still matters in those classes, not just what you’re writing! In fact, one could argue that if you can’t properly draft, revise, and reflect upon the writing you’re doing in a Debate or Civics class, then you’re certainly missing the point. And the larger point is, it’s time to take the writing process into every classroom, not just the freshmen English course, or the creative writing course. It’s about critical thinking, about the process of constructing new knowledge, and a whole host of other really powerful learning experiences that Bud comments on. He even goes so far as to push administrators to write with their staff on a regular basis. In closing, Bud points out that we write to reflect, to find out “what we know”. As human beings we are naturally born story tellers, and writing is a way to practice that inborn craft; to sharpen our minds, reinforce new knowledge, and twist it, mix it, and shape it until we own it. Having written fairly regularly on this blog for the past 6 years now, I can tell you that my ability to express myself through written word greatly surpasses my ability to express myself through any other medium; I sound like an idiot when I speak to people on any topic of importance, but when I write I have time to reflect, and carefully consider my message, and construct my thoughts. Bud Hunt knows this, I know this, and the people behind the Common Core standards know this! That’s why they’ve got a posse to back Bud up, and they’re coming for each and every one of us (in a good way). The standards that will soon be sweeping across Michigan and most of the United States set the bar high, but not so high that we can’t achieve what’s laid out for us. It’s time to start writing more WITH our students, in every classroom, and technology makes it easier than it ever has been to practice daily writing. Have your kids blog every day, assign them daily reflections of what they learned to make it simple. Work them up to collaborative wikis, where small groups share notes and persuasive essays, where they can reflect on the writing process through the revision history. Fire up Google Docs, and have students work together on lab reports, where they can model the writing process for one another in real time without having to read over someone’s shoulder. However you do it, just write, because Bud Hunt has a posse. 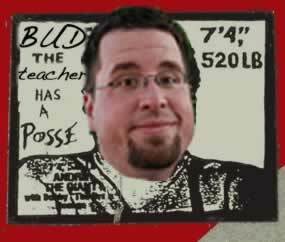 “@techsavvyed: Bud the Teacher has a Posse http://t.co/FhnZS7w”//when will Bud’s image be stuck to stop signs & mailboxes all over the US? This post really excited me. I am thinking of doing my doctorate project teaching teachers on how to incorporate this into their classrooms. I’m curious as to what Bud means by having administrators write with their staff. Howdy. What I meant by having administrators write with their staff was quite literally what I said. Reading and writing are foundational skills. Teachers and administrators should be engaged in authentic reading and writing tasks together throughout their work. That might look like authoring texts together, or reflective writing during meetings, or plenty of other ways. Let me know if I can provide further explanation. I’m a HUGE fan of authenticity, especially when it comes to reading and writing. Of course, my reading is mostly all digital now, but regardless, I blog to maintain my communication skills, and as a result my writing has improved dramatically over the last 5 or 6 years. The ability to express yourself through the written word is still powerful in this day and age, and will continue to be as it forms the basis for verbal and oral communication as well.